Good morning from Barber Motorsports Park! It was a cold and brisk 52°when I got out of the car here. But you could not ask for a more spectacular day. As I type, the temperature has already risen to 56°. The forecast promises that it will reach a high of 70°today. Let’s hope so. Tomorrow is supposed to be the same, but things may get ugly on Sunday. They are calling for cooler temperatures with potentially severe thunderstorms later in the afternoon. After two days of running on normal tires, they may be breaking out the rain tires on Sunday. It could get interesting. Prototype Challenge practice is just now starting. There are cars scheduled to be on track the entre weekend. If you are a racing junkie, this is the place for you. 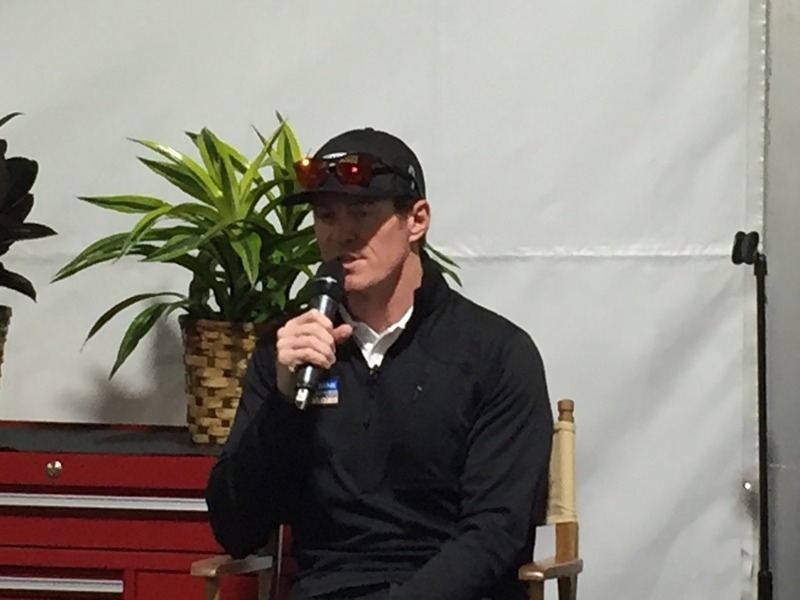 As I type, Scott Dixon is giving a press conference. He talked about the difference in the team dynamics this year. He says he misses his teammates from last year and it’s weird not having four cars on the team this year. He also compared the differences in having Tony Kanaan as a teammate for the past four years and Ed Jones this year. He said that while Kanaan was very vocal and animated in engineering meetings, Jones is very quiet. Dixon said “…if Ed were any more laid-back, he wouldn’t be able to stand up”. He also talked about the announcement yesterday that he would be competing in America Ninja Warrior next season and how he was looking forward to that. That will about do it for now. I’m going to venture out to the garage area for the first time and see what’s going on. I’m glad to know that Susan made her connection in Dallas and should land on time in Nashville, so that she can make the three-hour drive down here this afternoon. I’ll be posting sometime after the first practice that gets underway at 11:15 CDT. If you want more instantaneous photos and comments, please follow me on Twitter at @Oilpressureblog. You can also follow Susan at @MrsOilpressure. Please check back later. This entry was posted on April 20, 2018 at 10:28 am and is filed under IndyCar. You can follow any responses to this entry through the RSS 2.0 feed. You can leave a response, or trackback from your own site. Dixon: “He wouldn’t be able to stand up”. Pretty funny. I think Scott could do well on the Ninja Warrior deal. That might include some shots of Emma looking on.